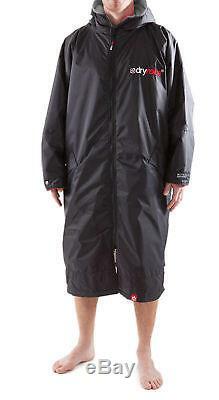 Dryrobe Advance Long Sleeve Towelling Changing Robe Mens Unisex Beach Surfing. Do you have a question? If you take the original dryrobe concept, cross it with the old school Swim Parka combine that with the versatility of a Zip front Poncho and then add all the functions & super warmth of the dryrobe Advance, you get the Dryrobe LS. The all weather change robe, featuring the essential Chunky YKK® Zip front, external pockets, large internal storage pocket AND MP3 player pocket! This really is the warmest change robe on the planet! 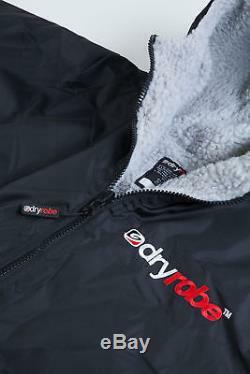 Dryrobe® The outdoor change robe. Ideal for changing sports clothing or wetsuits outdoors. Dryrobe® has a waterproof & windproof exterior nylon fabric & a lining that dries you & keeps you warm, Soft lined external pockets, large internal storage pocket & MP3 player pocket. Our Unique chunky YKK® Zip front is an essential element providing fast, easy exit & entry which allows you to get in & out of the dry robe® while you have all your kit on. This is simply not practical with the more traditional'pull over the head' poncho design. Cold-weather conditions present unique challenges. Preserve your energy & core temperature with full-body protection from the elements. Leave it on over your clothing or wetsuit & re-use multiple times throughout the day without the dryrobe ever feeling wet or cold. Get dry, cover up & stay warm with Dryrobe®. ADULT Size : Length : 1.2m long from shoulder body change space 84cm wide, The Adult size suits 5'1" up to 6'4" - lots of room to change inside. MEDIUM Size : Length : 1.2m long from shoulder body change space 72cm wide, The Medium size suits 5'1 up to 6' - Slim fit - ideal for the smaller woman or slim build. XXL ADULT Size : Length : 1.4m long from shoulder body change space 95cm wide, The Adult size suits 6' upwards or the extra wide. Waterproof outer shell 100% Waterproof & windproof outer shell fabric. One piece body construction with no shoulder seams. Super warm lining When conventional toweling gets wet it takes an age to dry and feels wet against your skin, throw in some wind chill and you'll know all about it. The Lining is a synthetic Lambswool which draws the water away from your skin, drying you instantly while insulating you and making you feel unbelievably warm. Full length 2 way reversible YKK® zip You can operate the zip from inside the robe, while changing, or from the outside, as normal. This is an essential element in the design so as to allow fast easy entry & exit. There is much more to know about the zip. All the seams on the dry robe advance are sealed. This, along with the minimal seam design ensure the best protection possible from the elements. External, soft lined, pockets The dry robe advance has deep'soft lined' pockets to keep your hands warm & store your stuff in too. Internal'poacher' pocket A huge'A4' size internal'soft lined pocket for storing underwear, clothing or thermal base layers. Internal zip entry iPod, MP3 / wallet pocket The inside chest pocket can safely store your valuable items and zip the sealed in a'2 way waterproof' pockets. Can't get wet from the outside or from the inside (if you are wet or in a wetsuit). Super light construction The lightweight materials used & design ensure that the dryrobe advance is surprisingly light. At only 1.3kg It can be packed down small into a compression sac, or carried anywhere easily. Credit/Debit Card via telephone - message for details. Cash on Collection from our Edinburgh Store. All UK & European orders will be subject to UK VAT where applicable. We may also be able to accept items back outside this time period. If there is anything you need, please don't hesitate to get in touch and we'll try our best to help. We consider ourselves to be very lucky, we work in an industry that we love. Everyone at Freeze is here because of a shared passion for skiing, snowboarding & surfing - and we get to surround ourselves with it everyday. We are never having more fun than when we're shredding fresh powder, riding through a perfectly shaped park, or tucking into a glassy dawn barrel - and helping other people do the same stokes us in the same way. Our mission is to make sure that when you're on snow or in the water, you are having as much fun as you possibly can - and to ensure that happens, we have what we call the Freeze Fundamentals. We ride what we stock. Whatever level you're at, your equipment is vital - it may be your first board, it may be one in a long series - either way we have you covered. We've always been very proud of the gear we have in the store - everything we have has been chosen based on the quality of the product, and how it performs. If we like it, we stock it - if we don't think it's good enough, we won't have it in the store - simple as that. This way you can be sure that when you shop at Freeze, you are choosing from the very best equipment, selected by experts. Good service comes as standard. At Freeze we pride ourselves on the service we offer. Since the very beginning, we have treated our customers as friends - many of them have indeed become close friends over the years - and this is an attitude we consider to be very important as we grow. Whether you come into the store, or interact with us online, we want you to have the very best experience, so if there's anything you ever want to talk to us about, please get in touch. It might be the smallest of things but sometimes it's those that can be the most important. It might be a design element in the shop that shows something in the best light, or just the way you move through the website - we put care and attention into everything we do, and still always find ways we can improve. If there's something that you think we can do better the let us know - our shop is your shop. This isn't just an industry to us, it's a community. We have a team of local riders that we support as well as international representatives. We grew with the support of the community, and will always look to cherish the roots of the sports that gave us the passion to do what we do. The item "Dryrobe Advance Long Sleeve Towelling Changing Robe Mens Unisex Beach Surfing B" is in sale since Wednesday, May 23, 2018. This item is in the category "Home, Furniture & DIY\Bath\Towels". The seller is "freeze_pro_shop" and is located in Edinburgh, United Kingdom.